Fall Lawn Disease Alert: Brown Patch is Back! Unfortunately, what many are actually discovering is that their lawns have succumb to a classic cool-weather fungal disease: Brown patch. If your lawn has brown patch, it probably looks a lot more like the one below than the one above. First off, let’s take a look back at our weather this past year. It’s been a tough one for lawns and landscapes. While the extra rainfall and humidity this spring may have been a great boost to local lake levels, and initially helped our drought-stricken plants and trees, it also caused a number of problems. The heavy soil saturation ended up suffocating and damaging a lot of plant roots and also encouraged a number of fungal disease infestations. Problems with TARR and brown patch both exploded throughout the DFW area. The brown patch that infected lawns back in spring is now reactivating and will continue to do further damage. What is Brown Patch Disease? Brown patch disease is caused by a soil borne fungus called Rhizoctonia solani; it becomes active in spring and fall when temperatures are cool and humidity or rainfall are abundant. Many types of turfgrass are affected by brown patch disease, including St. Augustine, Zoysia, Fescue and perennial Ryegrass. Circular patches in the lawn ranging from inches to several feet in diameter. Patches of grass turning a brownish yellow color. Infected leaf blades will have irregular shaped patches of yellow to light brown with a dark brown border. Foliage does tend to stay upright even when infected. What causes Brown Patch Disease? Nighttime temperatures above 68 ℉, humidity and regular rainfall are big triggers for a brown patch infection. However, over-watering your lawn is also a big cause of brown patch in the DFW area, especially in St. Augustine grass. Poor soil drainage, excessive thatch, and compacted soils in already stressed lawns will also encourage brown patch disease to move in. When lawns are already weakened, it can be difficult for them to adequately defend themselves from the disease. Don’t overwater your lawn. Follow proper watering practices. 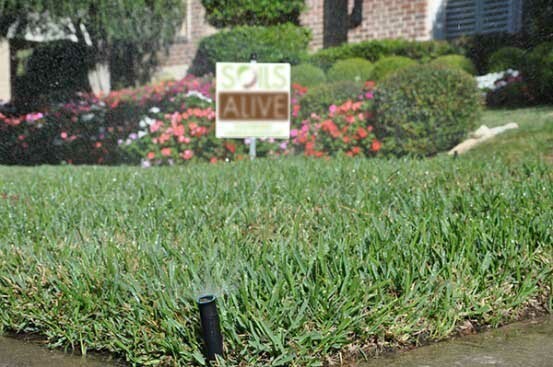 Reduce your irrigation through fall and winter. Feed the soil as well as the lawn. Healthy soil will encourage stronger lawn roots and top-growth. Healthy soil also better suppresses many soil fungal diseases. Aerate your lawn once a year. If your soil is compacted, it’s a good idea to aerate the soil once per year. Aerating will help re-oxygenate the soil and stimulate beneficial microbial activity.. Prevent excess thatch with good soil health, aeration and good mowing practices. When we visit your property as part of our Soil Building Program, we will inspect your lawn for diseases such as brown patch. There are natural fungicides that we can be used to treat brown patch if it has already infected your lawn. Don’t let brown patch disease spread unchecked. The more damage it causes to your lawn now, the less resistant your lawn will be to damage from freezing weather this winter or water and heat stress next summer. And you’ll probably end up with another full blown outbreak next spring.